If, like us you love silver jewellery and would like to learn to make it like the professionals using traditional methods, then The Silver Jewellery Workshop is for you. Our expert tutor, Michelle Leaver will guide you through all the basics from setting up your home jewellery workshop to working with sheet metal, soldering, texturing, filling, polishing and finishing and much more. This is a beginners level class although it is recommended that you take the 'Make a Silver Ring' course before in order to get the best out of this course. 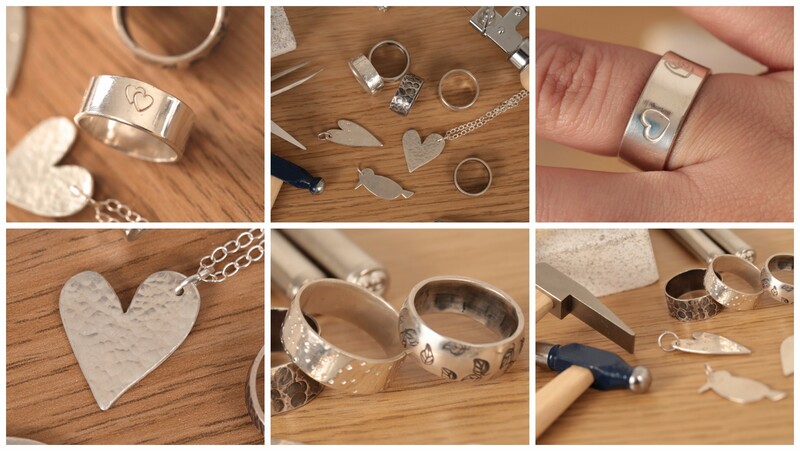 By the end you will have two pieces of handmade silver jewellery, a soldered, textured ring and a silver cut-out charm or pendant for a necklace. You don't need lots of fancy tools or equipment. Michelle will show you how to create your pieces with a few tools and materials which we can help you source so that is is easy for you to make and create at home. She specalises in silversmithing, enamel and jewellery business support and is a regular and popular teacher at the London Jewellery School. Feedback: How Was Your Course? What tools and materials do I need for this course? And where can I get them from? Silver Sheet: Recommended 1mm thick 3cmx3cm for silver pendant and 1.2mm thick, 0.8-1.2mm wide and 7-9cm long (depending on your ring size) piece for your silver ring. Just want this course? No problem! Click below to enroll on the course now and get instant access.